Creamy roasted garlic onion dressing is a delicious multi-purpose Japanese dressing. 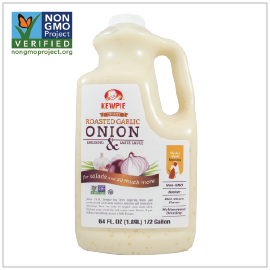 Delicious on salads and & as sauté sauce. Verified NON-GMO. Certified Kosher. The same flavor as Kewpie Japan recipe. Ingredients: Water, Expeller Pressed Canola Oil, Sugar, Distilled White Vinegar, Salt, Soy Sauce (Water, Soybeans, Wheat, Salt), Onion, Roasted Garlic, Natural Flavors, Yeast Extract, Egg Yolk, Xanthan Gum. 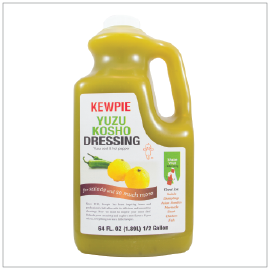 Authentic Japanese Yuzu Kosho (citrus and hot pepper) dressing. Great on salad, gyoza, Asian noodles, fried chicken, or with steak. Ingredients: Water, Sugar, Distilled Vinegar, Salt, Green Jalapeno Puree, Soy Sauce (Water, Soybeans, Wheat, Salt), Lemon Juice Concentrate, Natural Flavors, Yuzu Kosho (Yuzu Peel, Green Chile Pepper, Salt), Yeast Extract, Xanthan Gum, Yuzu Juice, Onion Powder, Green Color (Red Cabbage Juice, Turmeric), Beta Carotene, Spice.